Recently, YouTube sent me down a rabbit hole of videos purporting to have found a “trick” to remove plagiarism in any document. 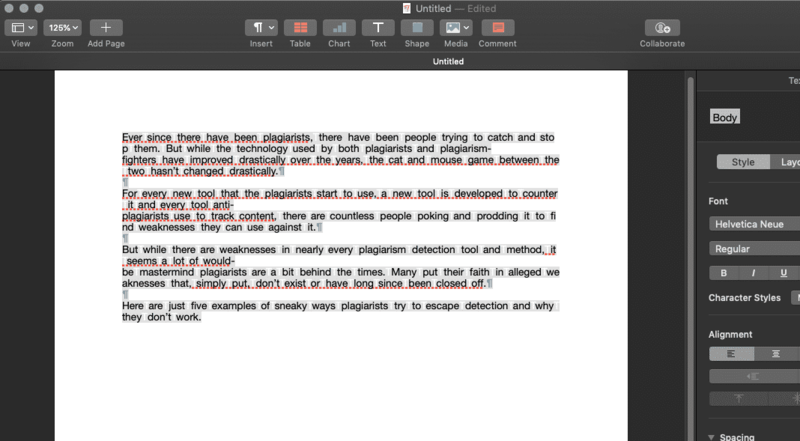 The videos, mostly made in 2016 and 2017, claimed that they had found a simple way to fool any plagiarism detection application. Though the videos showed several different techniques, many of which we’ve covered before, one new “trick” kept coming up and over and over again: The space replace. The idea is fairly straightforward. Using your word processor, you simply replace all of the spaces in the document with a character, usually capital “T” and then make that character white. 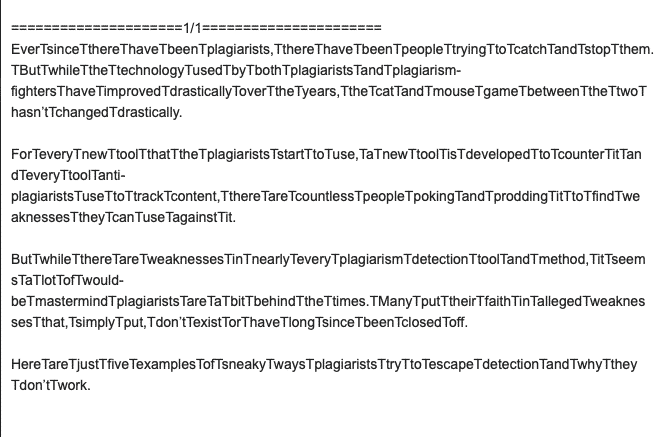 The idea is that the document will look fine to a human reader but that an automated plagiarism detection tool will simply see a long string of semi-random, albeit unique, characters. While all of that is true, there’s one very simple problem with this “trick”: It doesn’t work. No serious plagiarism detection tool will be fooled by this and no one experienced in plagiarism detection will be deceived. If anything, this “trick” risks making the plagiarism even more obvious. The reason is abundantly clear when you see how this “trick” looks from the other side. Though there are many videos on YouTube that showcase this trick, we are going to be using this one, which has over a quarter of a million views. Nearly all of the videos demonstrate the trick in Microsoft Word. Word’s find/replace functionality makes it very easy to find the spaces and change the font of what replaces them. However, for this article, we’ll use Apple Pages as it’s the word processor that I use most (other than Google Docs). I’m also going to use the intro to my previous article about sneaky plagiarist tricks, which is about 150 words. I first copy and paste that text into a document and then export it as a docx. The text pasted without alteration. Since the video used PlagScan, we’ll use it as well. We upload the document and, predictably enough, it comes back as (functionally) 100% plagiarized. With some effort, I was able to replace all of the spaces with white “Ts” and, almost immediately, a problem emerged. Since the text, in the eyes of the word processor is just a handful of really long words, the document’s formatting gets messed up and the spell checker goes a bit crazy. These would be red flags to anyone reading the document that something is off. It doesn’t help that my document, which is clearly over a hundred words, is listed as having just 16. Also, if you highlight the text, you can see the Ts, if only barely. Nonetheless, we export that document to docx and then run it through PlagScan (You can download this docx here). This time, PlagScan reports that it is 0% plagiarized. However, even in the document listing, something is clearly wrong. The document preview clearly shows the Ts in between the words. Things get even worse when you open up the report itself. The reason for this is simple, when plagiarism checkers examine a document, they strip away all formatting. This is what makes it possible for this “trick” to obtain a 100% originality score, but it also means that anyone who looks at the document, or even previews it, in the plagiarism checker will immediately see that it’s been tampered with. This is why, when you watch these YouTube videos about this or similar tricks, you never see a full plagiarism report. Instead, they simply show the 0% copied score and assume job well done. Unfortunately for those using this and similar tricks, they are very easy to spot. Any hope they have to work relies on significant human error. 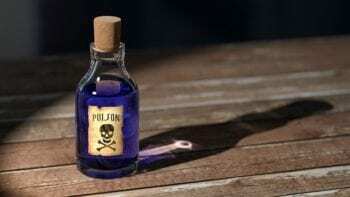 Furthermore, using such a trick is essentially providing proof that the plagiarism was malicious, likely any repercussions more serious than they would have been. To put it bluntly, this trick doesn’t work. If anything, it may make a plagiarism situation far worse. It joins similar tricks such as replacing letters, using macros, using article spinners and so forth as tricks that either don’t work or produce very low-quality writing. Instructors, administrators, and those who work in the plagiarism field know this and find these kinds of tricks to be of little threat. The danger is to the students. These videos and tutorials are targeted at students who are, rightly or wrongly, worried about being accused of plagiarism. However, rather than providing education about citation standards and how to properly paraphrase, the videos teach students that they can easily defeat plagiarism detection tools without having to improve their citation skills or even do their own writing. In short, these tricks provide the illusion of an easy out on this issue. That easy out will be most tempting to the most vulnerable students, the ones who should be getting actual help, not getting information on how to replace their spaces with Ts to make their work appear less plagiarized. 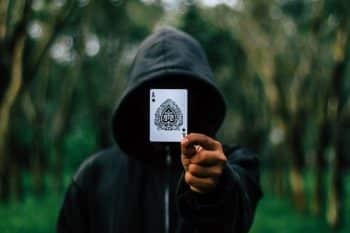 The students who watch these videos, many of which have hundreds of thousands of views, are likely to get a rude awakening when they actually try to put these tricks into practice and learn that the only person who got tricked was them. If you see a trick like this and it seems too good to be true, it probably is. Given what’s at stake, especially with the possibility or proving the plagiarism to be malicious, it’s simply not worth the risk. If you’re tempted to plagiarize and you’re considering using one of these tricks, my advice is simple: Don’t. Tricks like these do not work in 2018, if they ever did at all, and they usually stem from a misunderstanding of how plagiarism plagiarism detection systems work and how they’re used. Simply put, you’re much better off writing your paper the old-fashioned way.